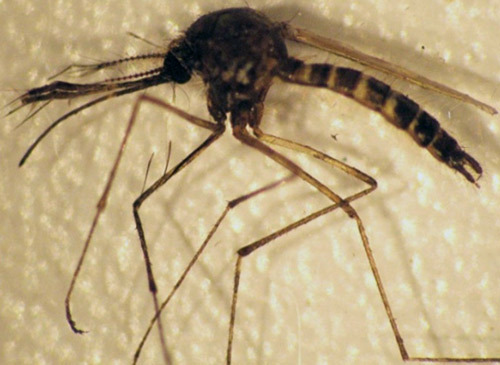 The black salt marsh mosquito, Aedes taeniorhynchus (Wiedemann), is very common in the eastern coastal areas of the Americas, and is responsible for a large part of mosquito insecticide applications in Florida (Connelly and Carlson 2009, Koehler and Castner 2008). Although it is not a primary vector of major concern, it can transmit pathogens to humans and other animals. Its characteristic emergence in large numbers after rains and flooding events as well as its aggressive biting contribute to its notoriety as a pest insect. 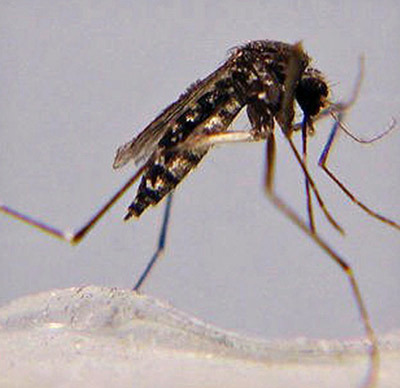 The black salt marsh mosquito is considered a nuisance in Florida. It is sheltered from large-scale mosquito control as part of the Everglades National Park conservation program to preserve their delicate ecosystem (Day et al. 2004). Figure 1. Bloodfeeding female Aedes taeniorhynchus. Photograph by Sean McCann, University of Florida. Figure 2. Adult female Aedes taeniorhynchus. Photograph by Michelle Cutwa, University of Florida. Figure 3. Adult male Aedes taeniorhynchus. Photograph by Natasha Agramonte, University of Florida. Aedes taeniorhynchus is found in the brackish, marshy areas of North, Central, and South America including the islands of the Caribbean. Although the larval habitats are typically restricted to the coastal salt marshes, this species has a long flight range and can be found far inland at times, particularly in Florida where it can be found throughout the state (Connelly 2006, Rey and Connelly 2010). Figure 4. Mosquito control worker sampling larvae in a marsh as part of a surveillance program. Image provided by Florida Keys Mosquito Control District. Figure 5. 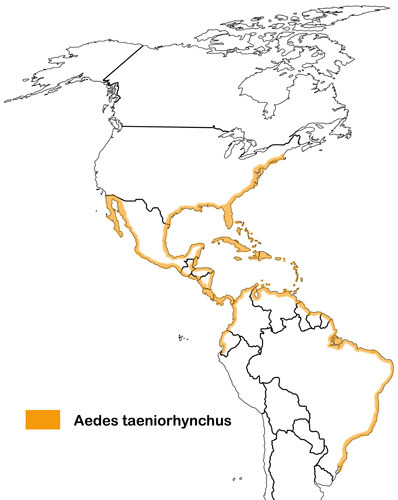 Aedes taeniorhynchus distribution. Image by Natasha Agramonte, University of Florida. Like other true flies, Aedes taeniorhynchus has four distinct life stages: adult, egg, larva, and pupa (Borror and White 1970). Adults: Like other flies (order Diptera), Aedes taeniorhynchus possess a pair of wings for flight and a pair of knobby halteres for directional perception and stability. Like other mosquitoes, black salt marsh mosquitoes have long, narrow wings with scales along the wing veins. Female mosquitoes of the subfamily Culicinae, like Aedes taeniorhynchus, also possess palps shorter than the proboscis. The mouthparts of mosquitoes are made up of a pair of stylets for piercing and a feeding tube for sucking. Collectively these mouth parts are refered to as a proboscis. Male and female mosquitoes can be distinguished by their antennae. Males have feather-like or plumose antennae, while females have antennae with only a few hairs (Borror and White 1970). Bands of white scales found in characteristic body locations are useful markings for identification of this species. 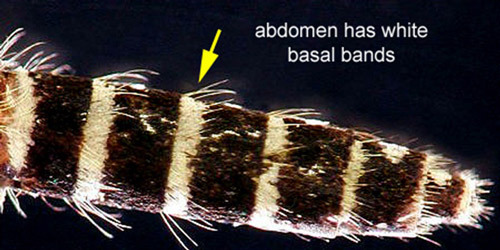 The white banding on the basal section of abdominal segments, typical of Aedes mosquitoes, as well as the white coloration on the tip of the palps and a ring of white scales on the middle of the proboscis, can be used to distinguish Aedes taeniorhynchus from similar species (Darsie and Morris 2003). Figure 6. Aedes taeniorhynchus adult proboscis. Photograph by Michelle Cutwa, University of Florida. Figure 7. Aedes taeniorhynchus adult abdomen. Photograph by Michelle Cutwa, University of Florida. Figure 8. Aedes taeniorhynchus adult wing. Photograph by Michelle Cutwa, University of Florida. Mating takes place soon after emergence, often within a few days (Foster and Walker 2009). Adults of this species can feed during the day if resting sites are disturbed (Rey and Connelly 2010), although feeding primarily occurs at night (Connelly 2006). While both males and females may nectar-feed, only females are haematophagous, or blood feeders. Mammals and birds are the preferred hosts for this species (Connelly 2006), but females will readily bite humans. 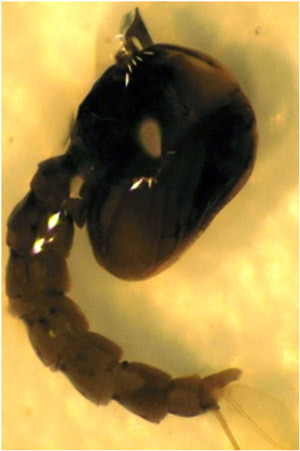 Females generally take a bloodmeal before ovipositing; however, this species is partially autogenous, whereby it can lay an initial clutch of eggs without a bloodmeal, unlike most mosquitoes (Lea 1964). Eggs: Eggs are laid in moist soil, not directly into water, in areas that are sheltered and high enough above the water line to be affected only by sufficient flooding, which will trigger eggs to hatch (Ritchie and Johnson 1991). Additionally, eggs may be deposited in, and hatched from, container sites similar to Aedes aegypti (Linnaeus), although this is likely an infrequent occurrence with this species (Rey and Connelly 2010). Egg hatching depends on flooding by rainfall or tides; however, once this occurs, larval development proceeds rapidly. Figure 9. Aedes mosquito egg. Image provided by Centers for Disease Control, #688. Larvae: The larval stage consists of four instars that may take anywhere from 5 to 15 days to complete, based on the ambient temperature. Larval development can occur in any salinity, from fresh water to ocean water (Nielsen and Nielsen 1953). Figure 10. 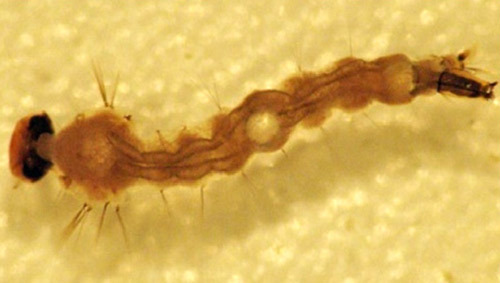 Aedes taeniorhynchus 4th instar larva. Photograph by Natasha Agramonte, University of Florida. Pupae: The pupal stage follows the fourth instar, and lasts for only a couple of days, after which the adults emerge. Pupae are active swimmers but do not feed during this life stage. Figure 11. 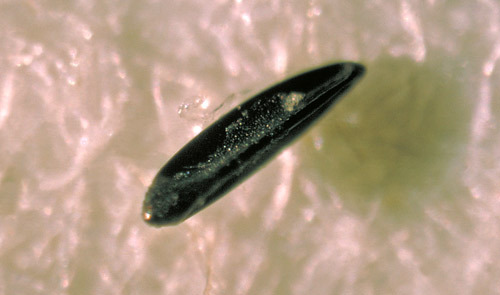 Aedes taeniorhynchus pupa. Photograph by Natasha Agramonte, University of Florida. Figure 12. Aedes taeniorhynchus adult female emerging from pupa. Photograph by James M. Newman, University of Florida. 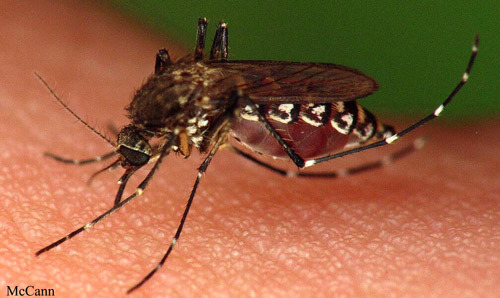 Aedes taeniorhynchus is medically relevant, primarily as a vector of two alphaviruses from the family Togaviridae, Eastern equine encephalitis (EEE) and Venezuelan equine encephalitis (VEE) (Drew 2001). Additionally, black salt marsh mosquitoes have also been known to transmit the filarial worm Dirofilaria immitis, commonly known as the dog heartworm. EEE virus is closely related to both Venezuelan equine encephalitis (VEE) virus and Western equine encephalitis (WEE) virus, which occasionally occur in Florida. As the name suggests, EEE acutely afflicts horses in the eastern United States, but it can also strike humans during seasonal outbreaks (Drew 2001). Both humans and horses are dead-end hosts for this virus because infected individuals do not produce sufficient viremia to infect mosquitoes. The EEE virus is primarily maintained in a cycle between the mosquito Culiseta melanura (Coquillett) and bird hosts in swamp habitats (Buckner et al. 2013). 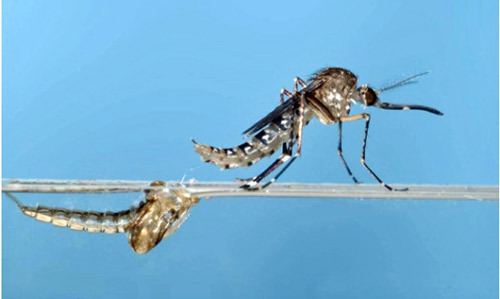 The transmission of EEE to humans requires different mosquito species, such as the black salt marsh mosquito, which can act as bridge vectors between infected birds and uninfected mammals, although other mosquitoes are more competent vectors (CDC 2009). Similarly, although Aedes taeniorhynchus is able to transmit VEE virus, Aedes sollicitans (Walker) is a better vector due to higher transmission rates and propensity for infection (Turell et al. 1992). Signs and symptoms in encephalitic patients start within 3-7 days of infection and include fever, headache, irritability, restlessness, drowsiness, anorexia, vomiting, diarrhea, cyanosis, convulsions, and coma (Drew 2001, CDC 2009). Approximately one in three people who develop encephalitic infections die (VEE and EEE), and those who survive will often have mild to severe permanent neurologic damage (CDC 2009); by contrast, the systemic infection of EEE displays mild symptoms for 1-2 weeks and has no lasting effects. Despite only causing about 6 deaths annually in the United States, control of EEE vectors is of particular concern to public health officials (CDC 2009). Figure 13. 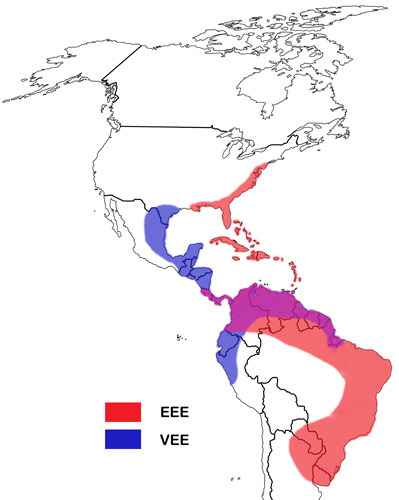 EEE and VEE disease distribution in the Americas. Image by Natasha Agramonte, University of Florida. In the U.S., black salt marsh mosquitoes are one of 16 species identified as competent hosts of Dirofilaria immitis, 11 of which are found in Florida (Nayar and Rutledge 2008). In the United States, transmission of heartworms to dogs most often occurs during the late spring and summer months when mosquito production is high. In the southern states, such as Florida, higher temperatures facilitate year-round transmission of this pathogen and present a risk to both wild and domestic animals. Figure 14. 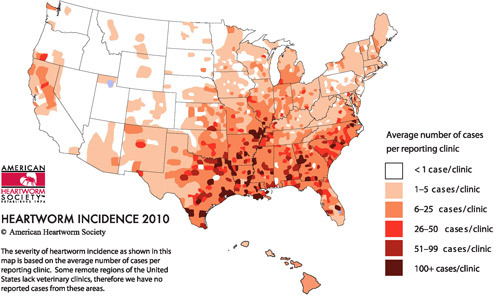 Incidence and distribution of heartworm in U.S. Image provided by American Heartworm Society. 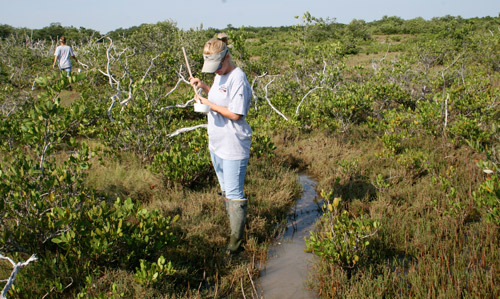 Control strategies for management of salt marsh mosquito populations are complex and often involve integrated mosquito management strategies that utilize source reduction (the elimination of mosquito breeding sites), surveillance (a measurement of the mosquito population size and species present), larviciding (the use of chemical or biological control on mosquito larvae), and adulticiding (the use of chemical control on mosquito adults). Source reduction can be accomplished through water management strategies which include impounding, ditching, and open marsh water management (OMWM) techniques, all of which aim to reduce larval mosquito populations by reducing the available larval habitat or by encouraging consumption of larvae by native larvivorous (larvae-eating) fish (Meredith and Lesser 2007, Rey and Connelly 2001). Chemical control can also be used and may involve the application of insecticides in the aquatic habitats where mosquito larvae are found or the aerial applications of insecticides to reduce adult populations of mosquitoes over marshes or in areas adjacent to human activity (Meredith and Lesser 2007, Rey and Connelly 2001). Personal protection techniques, such as the use of insect repellents containing US-EPA registered active ingredients, are encouraged for individuals to protect exposed skin in areas that may have mosquitoes (Xue et al. 2007). For individuals that spend a lot of time outdoors, long-sleeved clothing pre-treated with insecticide is commercially available as an added measure of protection for individuals, but should be used in combination with a repellent to be maximally effective (Xue et al. 2007). Screened windows and doors can also provide added protection to a home by acting as a physical barrier to the invasion of biting insects. Removal of mosquito larval habitats by emptying standing water from planters, buckets, kiddie pools, bromeliads and other containers is also a good general exercise in mosquito control. Although destroying container-breeding sites will have a minimal effect on Aedes taeniorhynchus, this practice can reduce the numbers of other mosquito species found around one’s home. Figure 15. Mosquito control professionals digging a drainage ditch for mosquito source reduction. Image provided by Alameda Mosquito Control Abatement District. Figure 16. Two planes applying an aerial insecticide treatment to a marsh. Image provided by Florida Keys Mosquito Control District. Borror DJ, White RE. 1970. Mosquitoes. Peterson Field Guides: Insects. Houghton Mifflin Press: New York, NY. p 266. Buckner E, Showman A, Connelly CR. (2013). Black-tailed mosquito Culiseta melanura (Coquillett) (Insecta: Diptera: Culicidae). EDIS. EENY-536. (21 April 2014). Centers for Disease Control and Prevention. (2009). Technical Fact Sheet: Eastern Equine Encephalitis. Division for Vector-borne Infectious Diseases: Centers for Disease Control. (16 April 2014). Connelly CR. (2006). Florida Mosquito Database. (15 October 2010). Connelly CR and DB Carlson (Eds.). 2009. Florida Coordinating Council on Mosquito Control. Florida Mosquito Control: The state of the mission as defined by mosquito controllers, regulators, and environmental managers. Vero Beach, FL: University of Florida, Institute of Food and Agricultural Sciences, Florida Medical Entomology Laboratory. Darsie RF, Morris CD. 2003. Keys to the adult females and fourth-instar larvae of the mosquitoes of Florida (Diptera: Culicidae). Technical Bulletin of the Florida Mosquito Control Association p 19-30. Day JF, Edman JD, Kunz SE, Wikel SK. 2004. Direct Injury: Phobias, psychoses, annoyance, allergies, toxins, venoms and myiasis. In Medical Entomology. Eldridge BF, Edman JD (Eds.) Kluwer Academic Publishers: Dordrecht, the Netherlands. p 99-144. Drew WL. 2001. Viral infection of the central nervous system. In Current Diagnosis & Treatment in Infectious Disease. Wilson WR, Sande MA. (Eds.) McGraw-Hill Companies, Inc.: New York, NY. p 453-462. Foster WA, Walker ED. 2009. Mosquitoes (Culicidae). In Medical and Veterinary Entomology. Mullen G, Durden L. (Eds.) Academic Press: San Diego, CA. 597. p 203-262. ITIS. 2014. Aedes taeniorhynchus (Wiedemann, 1821) Taxonomic Serial No. : 126381. The Integrated Taxonomic Information System. (16 April 2014). Koehler PG, Castner JL. (2008). Blood sucking insects. EDIS. SP-120. (16 April 2014). Lea AO. 1964. Studies on the dietary and endocrine regulation of autogenous reproduction in Aedes taeniorhynchus (Wied.). Journal of Medical Entomology 1: 40-44. Meredith WH, Lesser CR. (2007). 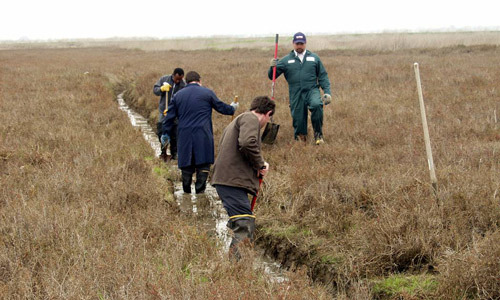 Open marsh water management in Delaware: 1979 - 2007. Proceedings of the New Jersey Mosquito Control Association. (15 April 2014). Nayar JK, Rutledge CR. (2008). Mosquito-borne dog heartworm disease. EDIS. ENY-648. (16 April 2014). Nielsen ET, Nielsen AT. 1953. Field observations on the habits of Aedes taeniorhynchus. Ecology 34: 141-156. Rey JR, Connelly CR. (2001). Mosquito control impoundments. EDIS. ENY-648. (15 April 2014). Rey JR, Connelly CR. (2010). Florida container mosquitoes. EDIS. ENY-860. (16 April 2014). Ritchie SA, Johnson ES. 1991. Distribution and sampling of Aedes taeniorhynchus (Diptera: Culicidae) eggs in a Florida mangrove forest. Journal of Medical Entomology 28: 270-274. Turell MJ, Ludwig GV, Beaman JR. 1992. Transmission of Venezuelan equine encephalomyelitis virus by Aedes sollicitans and Aedes taeniorhynchus (Diptera: Culicidae). Journal of Medical Entomology 29: 62-65. WRBU. (2014). Aedes taeniorhynchus (Wiedemann). The Walter Reed Biosystematics Unit. (16 April 2014). Xue R, Ali A, Day JF. 2007. Commercially available insect repellents and criteria for their use. In Insect Repellents: Principles, Methods, and Uses. Debboun M, Frances SP, Strickman D. (Eds.) CRC Press: Boca Raton, FL. p 405-415. Photographs: Sean McCann, Michelle Cutwa, Natasha Marie Agramonte, James M. Newman, University of Florida; Florida Keys Mosquito Control District; CDC, #688; American Heartworm Society; and Alameda Mosquito Control Abatement District.